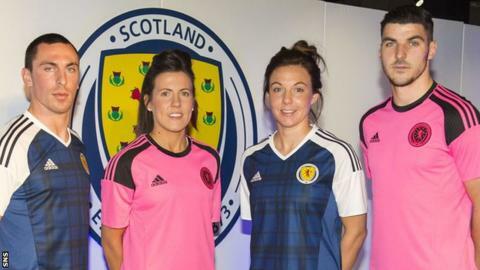 Scotland's new away strip is in "girly" pink according to Kevin Gallacher, but the former Scotland forward admits the colour brought him good luck. "This is the ultimate pink that you class for girls," he told BBC Radio 5 live. "It is a girl's colour. "But I don't think you can complain because there's a lot of teams who have worn pink now. "And I'm never going to complain because I scored my first two international goals in salmon pink." The new Adidas shirts will be worn for the next two years during the 2018 World Cup qualifying campaign. Scotland's new home kit sports a tartan-embossed print that the Scottish FA says is "reminiscent of the France 98 design", when they last qualified for a major finals. Their traditional navy blue tops now also have a new white sleeve design. The SFA said the away shirt "continued the disruptive theme of the previous, hugely popular update of the traditional Lord Rosebery colours". Archibald Primrose, the fifth Earl of Rosebery who became prime minister in 1984, was an early patron of the SFA and pink has featured in Scotland jerseys on occasions since then. There was a mixed reaction to the new pink and black strip on social media. The SFA itself released a promotional video in which a handful of current Scotland internationals express approval of the home kit but are less enthusiastic about the pink one. Celtic and Scotland captain Scott Brown joked: "I'm definitely going to look pretty in pink. The home kit is perfect. It's more my colours." Sunderland striker Steven Fletcher said: "The home one is really nice, but the away kit stands out. You'll need a good tan for that one." Everton forward Steven Naismith replied: "My pale skin doesn't go very well with the colour." Asked if he liked the pink strip, 48-year-old Gallacher said: "It's very bright, I must admit that. "The pink was quite lucky for me, but this is pink, pink. "But Palermo wear pink, Everton have worn pink, so nowadays it is part of a generation of colours. "It's a girly colour, but men have grown into wearing it and football clubs have got into them." Gallacher, who won 53 Scotland caps, preferred the new tartan gear. "I like the home strip," he said. "It is very different, with the white shoulders. "We had a tartan one as well in my day in the 90s. "It is always nice to have that through it and when you are playing in the sunshine climate of an away game then the pink one will come into use. "It will be nice and bright." Indeed, the SFA states that: "The use of neon pink and black detailing will ensure both players and supporters will stand out from the crowd on their travels." It adds that it "should inspire Gordon Strachan's team as they prepare to begin preparations for the Fifa World Cup qualifying campaign for Russia 2018".